Recent additions to the Antique Cufflink Gallery include diamonds with serpentine scrolls, elegant jades from Carrington, mesmerizing "Op Art", jazzy Art Deco sapphire cufflinks and a beautiful gold dress set with moonstones. 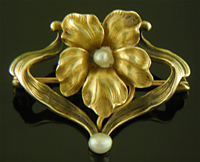 Recent additions to the Antique Brooch Gallery feature a diminutive Art Nouveau pin, a sapphire and pearl bar pin and a wonderful flower brooch by Whiteside & Blank. The Aviatrix Luminous white pearls and a bright blue sapphire. The overall design of this small brooch is reminiscent of the wooden propellers of early airplanes. Crafted in 14kt gold, circa 1920. 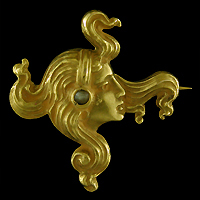 New to the Antique Stickpin Gallery is a striking golden scarab created by Carter, Howe.